How do you get customers to tell others about your business? True advocates can be your best salespeople—better than anyone you can hire. But in order for their advocacy to be effective, it has to be given willingly, without payment or incentives. In other words, you can’t control it. But you can influence it. Word-of-mouth marketing can happen on its own, but you don’t want to leave it to chance. Even when you are giving up control, you still need a strategy. As I say all the time, hope is not a marketing plan. Start with a story—and understand why they share your story. Know the channels where they live, and then supply them with the content to share. Social media is not about promoting your stuff. If you want to truly activate the power of social media marketing, you have to create a conversation, back and forth. In this episode of the podcast, I get into how to do that. As in the last episode, I mentioned a book called Brand Advocates: Turning Enthusiastic Customers into a Powerful Marketing Force by Rob Fuggetta. I’m assigning it to my students this term, and I highly recommend it to you too. 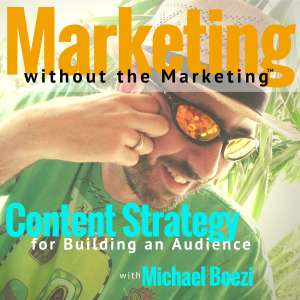 He gives a ton of data on how “word of mouth” marketing is way more effective than traditional “awareness” marketing—and how to activate it.